A controversial new project to allow limited hunting of Norway’s otherwise protected golden eagles (kongeørn) has set off widespread protests. The farmer-friendly Center Party won backing for the project, because the eagles are known to have attacked grazing lamb and reindeer, while opponents suggest it can spark as much international criticism as Norway’s whaling has over the years. Norwegian Broadasting (NRK) reported that a majority of Members of Parliament voted in favour of allowing hunters to apply for permission to shoot the large majestic eagles on the Fosen Peninsula in Trøndelag and in Troms County, Northern Norway. The vote came after debate on a proposal delivered by the Parliament’s energy and environment committee just last week. Supporters stressed that it’s “only a trial project” aimed at protecting livestock. “It’s not an official measure,” Torhild Aarbergsbotten of the Conservative party told NRK. She noted that more information is needed from areas where loss of livestock has been blamed on the eagles. “It’s been difficult to take out eagles that clearly are causing damage, and this trial project is aimed at making it easier (to shoot them) after applying for permission,” Aarbergsbotten said, adding that she hopes the pilot project will now proceed, starting this summer. Marit Arnstad of the Center Party (Senterpartiet, Sp), which also firmly and controversially supports hunting of wolves, bears and other protected species because of the threat they pose to livestock, claimed that Norway’s state institute for nature research has documented that many grazing animals have been lost to the golden eagles. “We have management of bears and wolverine, and that’s what we want with the golden eagles also,” Arnstad told NRK. Protests were swift, with Lars Haltbrekken of the environmental organization Naturvernforbundet fearing that permission to shoot eagles will damage their stocks, after years of conservation efforts to build them up since they were protected in 1968. Nature guide Ole Martin Dahle, who makes his living taking tourists on “eagle safaris” to watch the soaring birds, said he was “shocked” when he first heard about the proposal. “I haven’t been able to sleep since this came up,” he told NRK. “The golden eagles have high status among photographers, like lions in Africa and grizzly bears in Alaska.” Not only does he worry about a loss of income, but fears “a great loss” among the big birds. Other nature groups and ornithologists have also protested, along with employers’ organiation NHO, which worries about the effect of the hunt on tourism. “In the tourism business, experiences are now central and eagle safaris are in demand,” Ingjerd Sælid Gilhus of NHO Reiseliv told NRK. “Several professional players offer them.” She worries that the sector’s growth will be damaged. Several nature authorities in Norway, however, defend the hunt because of the damage the eagles can cause and because the eagle population in Norway is now considered stable. 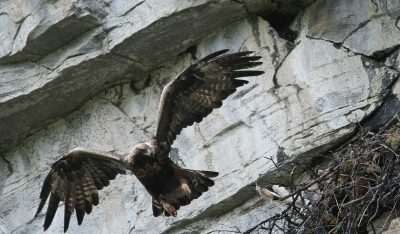 Nearly 1,000 nesting pairs of eagles have been registered in Norway over the past five years.